I blame Rhiannon for getting me into southern hemisphere fashion. NZ Fashion Week is in full swing, and I've been regularly checking their local blogs for any and all updates about the event. Already, plenty of great shows have gone on and I've been doing my best to locate clear, solid runway photos to lust after - shots of Ingrid Starnes, Lonely Hearts, and Salasai, to name a few - and Juliette Hogan with her F/W 2012 collection, which is much more mature than the designer's previous looks. I've got to be honest, I might like her past collections a bit better.. I'm a sucker for feminine things. But this winter collection has a lot to be loved, including that sheer cream floral dress, accordion pleats, and those perfect detachable leather collars. 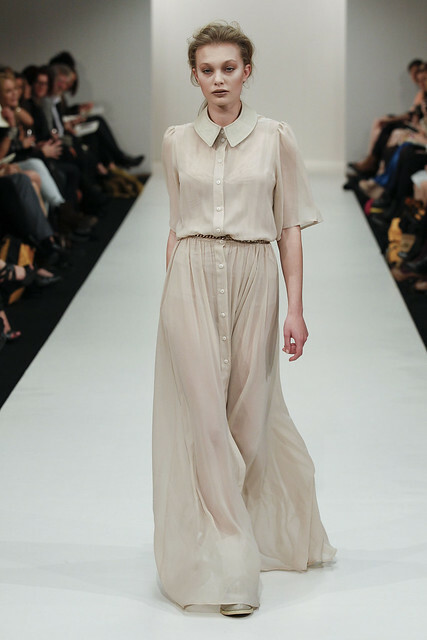 All images courtesy of Michael Ng at NZFW. To see more, go here or check out the video below (courtesy of the New Zealand Herald).